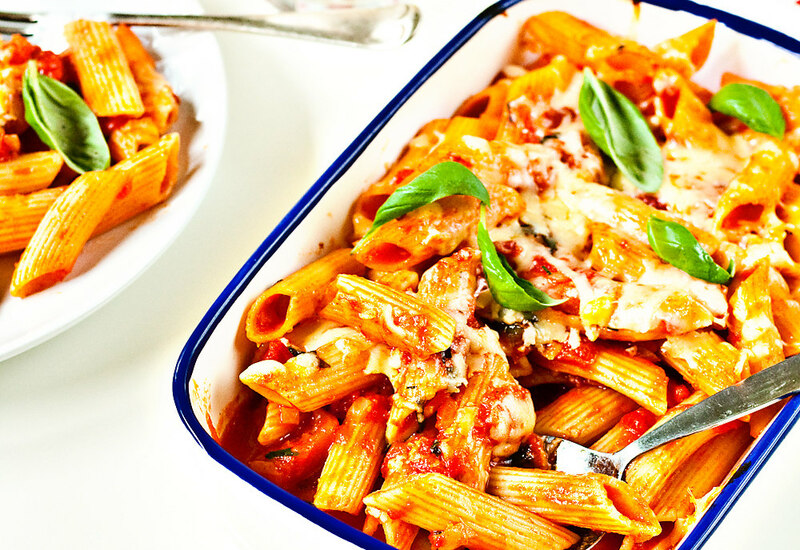 Think of this dish as a vegetarian baked ziti, just with a different pasta shape. It's an easy recipe that's simple enough to throw together for a weeknight dinner. With a tomato-based sauce, fresh basil, and a layer of gooey cheese on top, this baked pasta is a comfort classic that the entire family will love. If you don't have penne, choose another short pasta shape. You could stick with the traditional ziti or rigatoni. For some fun, try rotini (corkscrew shape), farfalle (butterfly), or rotelle (wagon wheels). The pastabilities (sorry!) are endless. This recipe doubles nicely so you can have two dinners for the work of one. Freeze the second batch for later. Just thaw at room temperature for an hour before baking at 400°F (210°C) until heated through, about 30 minutes. Mix some shredded Parmesan cheese in with the mozzarella cheese for a different cheesy flavor. If you want to add more protein to the dish, stir cooked sausage in with the tomato mixture before combining with the pasta. Per Serving: 194 calories; 10g fat; 17.0g carbohydrates; 9g protein; 22mg cholesterol; 439mg sodium. A great family dish- add chopped spinach leaves before you bake to give it some healthy greenery. a simple penne bake that turned out great - I opted for mozzarella instead of cheddar, like the recipe called for, since I already had it in the fridge and it was delicious.